President Muhammadu Buhari on Friday told German Chancellor Angela Merkel that his administration is not in support of illegal migration. Buhari disclosed this during a press conference by both leaders at the presidential villa in Abuja. He stressed that Nigerians involved in illegal migration are doing so at their own risk. “I’m against my countrymen and women who illegally find their way to other countries. “We do not, as an administration agree for Nigerians to defy the desert and the Mediterranean because they feel that there are greener pastures over there. We do not support anything illegal and indiscipline. “We do not support anything illegal and anybody who feels that his country does not value him or offer him what he should be offered as a citizen and decide to defy the desert and the Mediterranean is doing it at his own risk,” he said. 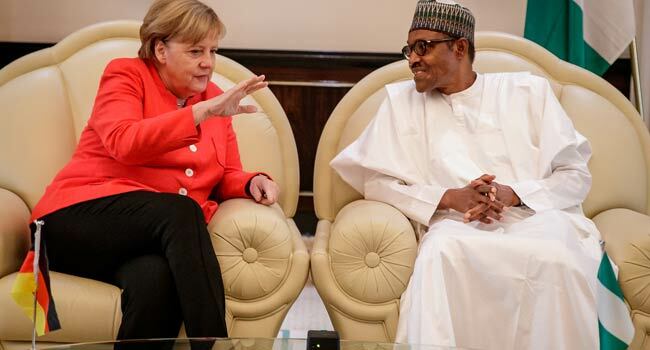 While Merkel revealed efforts of the German government to tackle the scourge of illegal migration, President Buhari said his government has made efforts to repatriate some Nigerians, especially those stranded in Libya. Other issue discussed by both leaders include economic cooperation between both countries, among others. 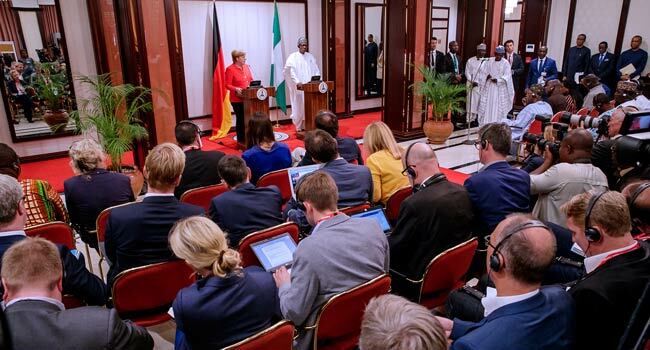 President Muhammadu Buhari and German Chancellor Angela Merkel during the press conference.